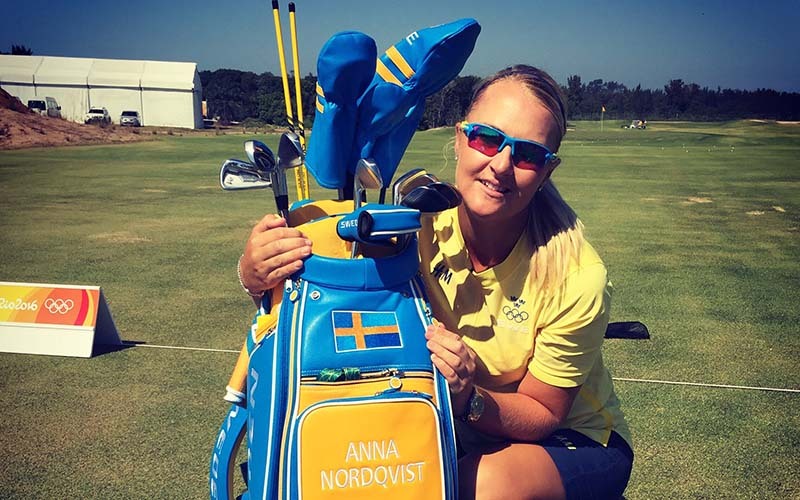 RIO DE JANEIRO – Former Arizona State University golfer Anna Nordqvist has been reunited with her golf clubs, just days before she is set to compete in the Olympics. Nordqvist tweeted shortly before noon Sunday that her golf clubs and her bag had arrived in Brazil, two days after she arrived in the country. In an e-mail to Cronkite News, the airline said Nordqvist was reunited with her bag just in time to compete on Wednesday. “We were so happy to see the picture of Anna reunited with her bag and we wish Anna the best in her game this week,” United Airlines’ spokesman Jonathan Guerin wrote. Nordqvist tweeted Friday morning after arriving in Rio de Janeiro that she was here, but her golf clubs were not. United Airlines tweeted a response five minutes later, saying they will “try to find some updates” on her bag. In an e-mail to Cronkite News Friday, before the bag was returned to the Swedish golfer, the airline said it was working to reunite Nordqvist with her golf clubs as quickly as possible. Nordqvist tweeted a Cronkite News reporter, after United’s statement was released and said that it was “not true” and that the earliest she would get her bag was the next day. @TylerFingert @united @cronkitenews Not true.. earliest tmrw afternoon. fingers crossed! Nordqvist is scheduled to play her first Olympic round Wednesday. This is the first time golf is being played in the Olympics since 1904. The Swedish golfer attended Arizona State University for two and a half years between 2006 and 2008 before joining the LPGA. Story updated at 2 p.m. Arizona time.